The advancement of robotics will happen more quickly and provide more value with collaboration in the community around the adoption of reasonable interoperability standards. Why is integration among systems so important? How does this affect the value that a robot can bring to an industry? In many ways, robotics is now where computers were several decades ago. There is no denying that computers and the internet have drastically changed the world—computers are now used in ways that weren't ever imaginable, and have helped people around the world to achieve levels of education, employment, and freedom that were previously out of reach. Robotics will follow the same path. We are right at that tipping point, and if done right, robotics can be a boon to the entire human race. But the only way to get over that threshold is to allow robots to seamlessly integrate with other systems– hardware to hardware, hardware to software, and software to software. In order for the robotics industry to propel itself forward, it needs to be able to build on what others have already done. This is a lesson learned from the computing industry; it was not until low-cost computers could run software written by a variety of companies that computers started to see real adoption in business. It was when they could easily connect to the rest of the world through the internet, allowing for easy email and web-browsing, that the computer industry really took off in a mass-consumer way. Most recently, this is what apps have done for mobile. By building on each other’s successes, we can rapidly advance the industry and therefore grow a bigger pie for the entire community. Computers have streamlined this process, as the feature that made them valuable is the ability to share information. As an example, consider a QCBot delivering medication from the pharmacy to a nursing station in a hospital. Without integration when a delivery needs to be made, a person would have to find a robot, manually load the medication into the robot, tell the robot where to go, and send it on its way. At the other end, someone would need to realize that the robot was making a delivery, and then manually unload it. On the other hand, when fully integrated at the software level, the robot will automatically know from the hospital information system when deliveries need to be made. When integrated at the hardware level, the robot will be able to automatically pick up and drop off the deliveries without distracting a human from more important tasks like caring for a patient. When robots are truly integrated they will often become invisible, quietly doing their jobs without interrupting people. Another simple example is a robot’s ability to use elevators. Right now there is no standard for robot elevator use. Each company builds a custom solution. That might be fine if no one ever planned on deploying robots from more than one company in a building. Obviously that won't be practical as there will be a wide variety of robots on the market, each with a different set of capabilities, and there won’t be a one size fits all solution. Interoperability is the only viable solution. Because we are still early in terms of market adoption for a lot of these types of robots, there aren't a lot of interoperability standards yet. This gives us an opportunity to be proactive as an industry and define standards that will help make mass adoption of robots possible. Helping to define those standards is part of the mission of Mass Robotics and partner organizations like The Robotics Industries Association. This type of activity can have a big impact on making meaningful integration practical for the companies building or implementing robotics solutions. You believe that, in order to propel the robotics industry forward, robotics companies need to collaborate. Why is that? What, if anything, do you think is holding the industry back? Following up from above, the advancement of robotics will happen more quickly and provide more value with collaboration in the community around the adoption of reasonable interoperability standards. One reason this is hard is because it is easy to put it off, or expect that someone else is going to do it. Other things that will help propel the industry forward are increasing investment and adoption of automation by large companies, avoiding reinventing the wheel, focusing on the solution rather than the robot, and for the long-term, addressing a stronger focus on education. Large companies are starting to seriously explore investing in their operations by adopting robotics. Robotic technology today is ready to be used to solve practical problems at large scale, and those companies that figure out where to effectively leverage robotics early on will have a huge advantage over their competitors as the pace of change and the need to adapt quickly in the global economy continues to increase. Robotic technology isn't perfect, but the time has come to get it out of the lab and doing what it’s meant to do—work. Problems and imperfections often don’t surface until technological solutions are out in the real world. As long as we keep robots in the laboratory, we’re not going to make progress—we’re going to be focusing on the wrong problems until we make that leap. Another thing that has been holding the industry back is too much wheel reinvention. A startup that wants to market gizmos on the web would be crazy to start out by trying to build their own computer from scratch to host the website. The computer isn't the value add, it is their unique application. In the robotics industry, there are numerous off-the-shelf robotics systems out there that people could use to build their unique applications on, but for some reason, there is a strong tendency to want to build new robot hardware from the ground up. Which leads to the point about focus. While it may not sound right, much of the robotics industry focuses way too much on robots (hardware), and way too little on the customer and the problem the robot will solve (software). Customers need their problems solved quickly, robustly, and cost-effectively. If a robot is a good fit, that’s great, but the focus must be on solving the problem, not how cool robots are. Also, it is important for people to realize that successful robotic systems are going to be mostly software. Robotics is 90% software—it’s what makes the robots useful. One major thing that is lacking in our economy is access to enough engineering talent. We need to revamp the education system to encourage kids to start thinking creatively rather than memorizing facts, and to start engaging more actively in STEM disciplines. We can make science, technology, engineering, and mathematics significantly more interesting by showing kids real world applications and getting them to build and code much, much earlier. In fact, it’s been shown that project-based learning is significantly more effective than facts-based learning or exam-focused education; it’s a method of learning that actually sticks. Which industries do you see as the most promising opportunities for the growth of robotics in the next few years? There are exciting new startups popping up every day; for example, there are a number focusing on mass customization, where robots make it possible for customers to get a product tailored specifically for their needs but at mass-manufactured prices. Farming robots are a hot topic right now and is something that I am personally very interested in. I also think personal autonomous transportation and delivery is going to be big. Like it was with computers, all segments of our society will be dramatically affected by the growth in the robotics industry. One of the areas that robotics can make a direct impact in is assistive technology, where the technology fundamentally changes lives for the better. For example, students like Christopher Leon who were not physically able to go to school can now do so using a VGo telepresence robot. Chris has excelled academically, opening up a wide range of possibilities that just weren't available to him before. In fact, he is planning to go to college next year. I get pretty excited when robots allow people to accomplish things that were previously difficult or even impossible. There has been a lot of selling of robotics companies lately - and also a rising interest from multiple sectors in buying or investing in automation solution providers. How do you explain this movement? I think the general population and corporations around the world are starting to see that robotics is the future of our economy and that if they don't start to play in that space, they will likely be left behind. The technology is ready for adoption and now is the right time to invest, but, just like the Dot Com era, it can be hard to sort out the real value from the hype. I hope we can manage to remember the Dot Com boom and bust and apply those lessons learned as robotics starts to generate similar levels interest and investment. How do you answer the concern that robotics will put humans out of work and cause economic issues in the future? It’s no secret that robots will change the way we do things, and in the process change the career opportunities available. This is the way technology has worked for hundreds of years. Someone figured out a better way to weave cloth, and most of the people that formerly weaved cloth went on to different jobs. Because of this automation, cloth and hence clothing is more affordable and available now than at any other time in human history. Not too long ago, if I were poor, I would only have one set of clothes, and if I lived in Africa, I might not have any, but now there is an abundance of clothing on the planet. So the tradeoff is often temporary employment disruption and change on one hand, and better access to goods and services for all people on the other hand. The specific challenge here is that the change is happening faster than ever before, making it difficult for people to adapt and learn new skills fast enough. With more widespread use of automation, companies and society as a whole are facing a huge “change management” issue. We need to have a plan for how that shift is going to happen. It will take the combined efforts of industry, academia, and government to ensure that people aren't left behind in the process. Ideally, robots will allow humans to overcome their limitations in supplying basic needs. With everyone having access to basic needs – food, shelter, water - we can connect and contribute in more meaningful ways. This means allowing us to focus more on the creative, high-value jobs as well as caregiving – like nursing, caring for the elderly, and childcare. But, it’s incumbent upon industry, academia, and government to define this vision and to work together to help ensure that everyone wins in this transition. Vecna has been developing robotics for logistics for some time. Tell us about your most recent innovations for the logistics and material handling industry. How do they differ from what is currently being used? Practically everything we eat, drink, drive, wear and own came to us through a complex supply chain where human labor is employed to pick things up and put them down again in a different location. That’s where our family of robots comes in. They’re equipped to autonomously retrieve pallets, boxes, and even individual parts robustly while requiring little if any infrastructure changes. Most autonomous material-handling equipment on the market today tend to be infrastructure heavy, and lacks the flexibility to adapt rapidly to changing needs. We also provide services to integrate the robotic systems with an enterprise’s IT systems in ways that provide superior efficiency of the systems and convenience for the users. Additionally, our robots are specifically designed to work collaboratively and safely with humans. In our system, we think of a system of “agents,” each with specific abilities. The agents can be a combination of a variety of robots and humans. The multi-agent coordination and planning features of our system can identify the best agent for a task and deploy that agent, whether it’s a human or a robot. This is one of the ways that we improve productivity – by using humans for what they’re good at (creative problem solving), and by using robots for what they’re good at (repetitive, dirty, and dangerous jobs). Using this approach, manufacturers and material handlers can prevent death, injury, damage, and delays, and also save billions of dollars annually. We’ve invested heavily over the years in building a robust world-class autonomous navigation system; now we’re applying that technology to broader areas. For example, the same technology can be applied to people movers and personal transportation platforms, all robustly-integrated to allow operations to be more flexible, robust, and efficient than ever before. 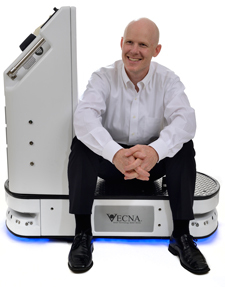 Daniel Theobald co-founded Vecna in 1998 with the mission to empower humanity through transformative technology. Vecna is a leader in logistics automation and telepresence with thousands of robots deployed worldwide. Daniel also co-founded Vecna Cares (2008) and Mass Robotics (2015) both 501(c)3 organizations with missions to improve the lives of people around the world through ethical application of technology to solve some of the world's toughest problems. Vecna's talented and dedicated employees not only make it a fun and profitable business, but they also have contributed over 100,000 hours of community service to date. Daniel has a blast serving as the Chief Innovation Officer at Vecna and currently serves as the President of MassRobotics. He graduated from MIT where he worked as a researcher on the Mars Rover in the Artificial Intelligence Laboratory.